Blackheads are small bumps that appear on your skin. They appear due to clogged hair follicles. Blackheads got their name because the surface looks dark or black. Considered a mild form of acne, they usually appear on your face, but can also appear on the chest, neck, arms, shoulders, and back. Acne is the most common skin disorder in the United States, affecting more than 50 million Americans. And you have to understand that blackheads are an on-going problem. Because they appear due to excess oil, even when you remove them, they can naturally reform. With that in mind, we will talk about the causes of blackheads, prevention, and how to get rid of them using a blackhead remover. 3 What are treatment options for blackheads? 4 Can you prevent blackheads? 5 How to buy the best blackhead remover? 6 How do you know a blackheads remover is good? 7 Which blackhead remover is good for your skin type? 8 How to use the blackhead remover? It is important to understand the nature of every problem you have. When it comes to blackheads, they form when a clog or plug develops in the opening of hair follicles in your skin. Hair follicles contain one hair and a sebaceous gland that produces oil. The oil, called sebum, is what keeps your skin soft. In other words, your skin needs oil. However, when dead skin cells, oils, dirt, and other impurities accumulate in the opening of the skin follicle, they can produce a bump. Over time, this bump becomes black, and a blackhead forms. Blackheads are very easy to spot on your skin. They are dark in color and slightly raised on your skin. They are not painful. Unlike pimples, blackheads are not inflamed. Pimples form when bacteria invade the blockage in the hair follicle and causes irritation and redness. Blackheads form in a different way. What are treatment options for blackheads? There are multiple acne medications and treatments that you can get for blackheads. We will talk later on about the best blackhead remover. Now, while we are talking about the blackhead remover, we have to also address another question. And that is, how and can blackheads be prevented? The answer is yes, you can prevent them with proper skin care. Here are some tips on how to prevent blackheads. How to buy the best blackhead remover? A blackhead remover can help you get rid of blackheads in your nose and cheek area. But there are different factors that make a blackhead remover good or bad. Not all products work as efficiently. Here are some factors to look for. Look for a product that is formulated for the specific concern. Regular face washes and scrubs do not help with blackheads. Your best options are some clay-based masks or products with clay in the ingredients that absorb all the dirt and oil from the skin. Masks that contain vitamins and minerals help revitalize the skin and improve its texture. You have to look for the ease of use. Peel-off masks can be messy, and also painful. Blackheads remover products can be either peel-off masks or rinsing masks. Choose one that is easy to apply, and easy to remove afterward. You do not want any discomfort or pain. Last, but not least, we want to share what is the price range you can expect. Blackhead removing products go from $10 up to $50. This depends on the quality and ingredients. Generally speaking, a mask costs more than a strip, as it contains more quantity. How do you know a blackheads remover is good? Well, for starters, you can choose to trust our choice. We’ve reviewed many products, and chose the five best options. But as a general rule of thumb, a good product is those that have a mineral-rich formula and contain a lot of natural ingredients. Not only they help you remove dead skin cells, but they also tone your skin, resulting in glowing, radiant, and youthful looking face. Using them on blackheads will rejuvenate and freshen up the skin with a new layer on top of the old one. Which blackhead remover is good for your skin type? 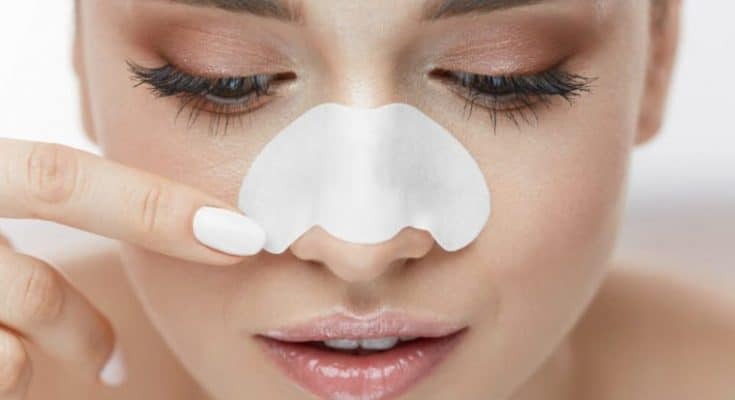 No matter if you are buying a blackheads remover, or any other skin product, you always want one that is specifically formulated for your skin type. Other formulas can further damage your skin. If you have problems like oiliness, uneven skin tone, or dryness, go for products that contain ingredients for that concern. Buying a product that is suitable for all skin types is also an option. Just remember, if you have sensitive, choose a product without any dyes or fragrances that can irritate your skin. How to use the blackhead remover? This is an important aspect, as you might get the best product, but if not used properly, there will be no results. How to use the blackheads remover? Being that the remover will open up your pores and penetrate to cleanse them, you want to use a suitable product afterward. That means a product that will close your pores, and reduce the risk of blackheads revival. You can close your pores simply by massaging your face with ice after using a blackheads remover. In addition, here are some tricks and tips for using blackheads remover. This face mask has been dubbed as the world’s most powerful facial. The wonder power is praised for its skin-healing properties and removing blackheads from your face. And with almost 20,000 reviews on Amazon, this is a product many have tried and tested. Spoiler alert: 90% of the reviews are positive. You cannot buy that much good publicity. 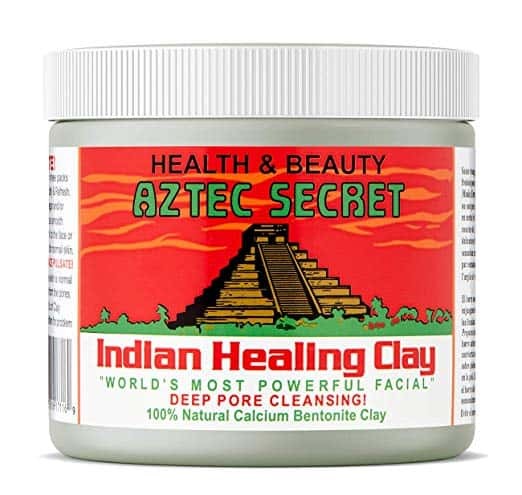 With that in mind, what makes this facial mask special is because it is made of 100% natural clay. The formula is free of chemicals, preservatives, and anything else that can cause damage to your skin. Putting it on your face will absorb all the dirt. To get the paste, you need to mix the powder with either water or apple cider vinegar. If you have sensitive skin, water works better. With a price that is as low as ever, this is by far one of the most, if not the most popular blackheads removing the product. Keeping your skin radiant and clean, you can also use it to temporarily reduce the appearance of pores. 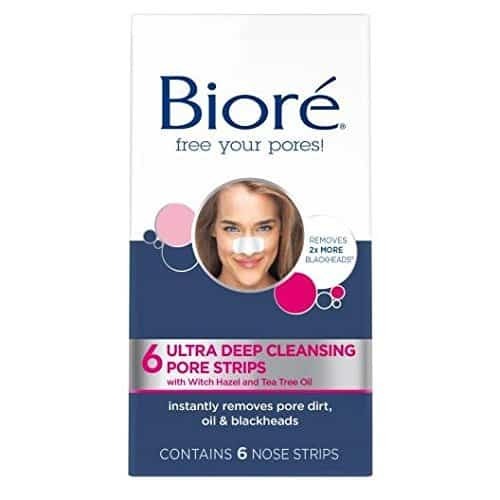 If you’ve dealt with blackheads before, you’ve almost certainly heard of Biore’s pore strips. They have been one of the most popular items in a skin care routine for decades. While they are generally considered great for teenagers and their acne problematic years, the pore strips by Biore belong in your adult cabinet as well. The two active ingredients that help with acne and blackheads are tea tree oil and witch hazel. Both have been studied and tested and confirmed they help with the issue. These pore strips pull out 2 times as many blackheads than any other product on the market. They work by locking onto and lifting out deep down dirt and oil on your skin that can cause blackheads. All you have to do is spend 10 minutes of your time, and blackheads are gone. Suitable for all skin types, you can use them once or twice per week. A little bit pricier than the rest of the products, but it is still well in the range of affordable best blackhead remover. This mask is known as the fountain of youth because it has an amazing effect on your skin. And you get that glowing, youthful looking skin in just a few uses. With jojoba oil, aloe vera, calendula oil, and sunflower oil, the mask provides a calming and refreshing effect on your skin. How it helps the skin? By cleaning pores thanks to magnesium and sodium. These two minerals have high detoxifying properties. In addition to removing blackheads, you can also use it to work on blemishes and achieve a lighter tone of your skin. Best served for those living in cities with high pollution. 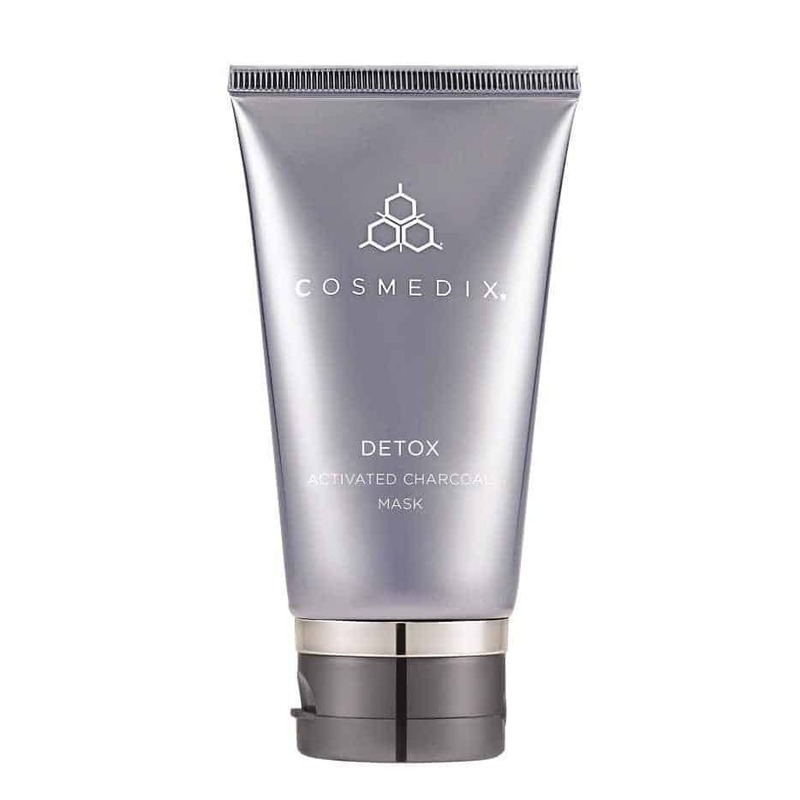 The charcoal masks will help eliminate all of the toxins sticking to your facial skin due to pollution. Approved for sensitive-skin as well, and great for reducing the appearance of large pores. 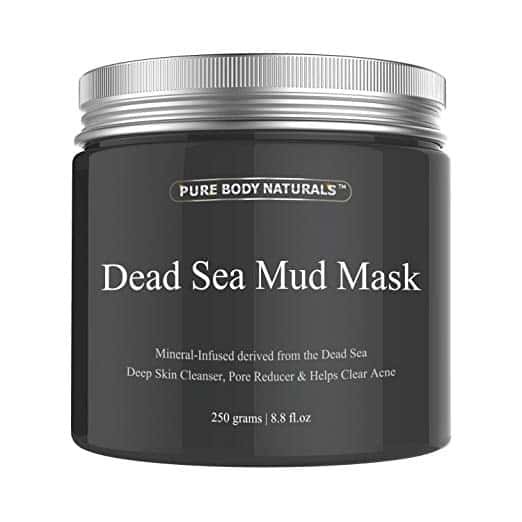 This mask will instantly detoxify your skin, and provide gentle exfoliation as well. After use, your skin will be smoother, brighter, and more radiant. The texture of this mask is smooth, and after staying for 10 to 15 minutes on your face, it will not dry and crack like similar charcoal masks. 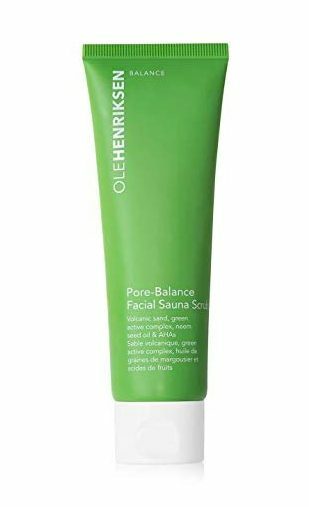 This unique face scrub was inspired by traditional Scandinavian spas. With a dual warm and cool action, it helps refine pores lift skin, and eliminate dead skin cells. Formulated with glycolic and lactic acids, the scrub can penetrate deeply to purify your pores, absorb excess oil, and leave your skin feeling smooth and soft. The scrub works just like a spa treatment. You get a warming sensation that will open up your pores, and then a cooling down that will close the pores once they are clean. Works amazing for oily skin, reducing the appearance of pores, blackheads, and uneven texture of your skin. The formula contains volcanic sand, neem seed oil, and Green Fusion complex.